We’d love your help. Let us know what’s wrong with this preview of All for One by Melody Carlson. To ask other readers questions about All for One, please sign up. Just like with the previous entry in this series, I can understand what the characters go through, even if I'm not the target audience. Thought it was a good book but not great. Felt a little flat to me. Plus this is not a stand alone book, you really need to read the previous books to get the whole picture. One of my goals is to start reading through my physical book to be read pile alongside my official review books. After all, it makes it easier to downsize if I know if I actually like something or not! This book was sent to me ages ago by the author along with some of her other books after I won a contest that she was doing. This story had just enough "what's next" to keep me reading. The relationships between the characters seemed very real and thought out. This was book three in One of my goals is to start reading through my physical book to be read pile alongside my official review books. After all, it makes it easier to downsize if I know if I actually like something or not! This book was sent to me ages ago by the author along with some of her other books after I won a contest that she was doing. This was book three in a four book series and the author didn't send me any of the other books so I assumed it could stand alone. Turns out that I was mistaken. More than once I had the very strong impression that I should know more than I did about a character or about something that had happened. Also, the synopsis on this book isn't exactly the story that's inside the pages of the book and that always leaves me feeling misled by the author. This is the third book of the 4 Lindas series. Abby sets up her bed breakfast on a trial run with two guests. Janie is setting up her office to begin her law practice in Clifdon. Marley is settling in being an artist. Caroline is still taking care of her mom. She has to decide when to put her in a home as her mom’s Alzheimer’s is rapidly progressing. I appreciated the religious undertones but thought the book lacked depth of characters. There was a lot of talk about Paul's health and how he treated Abby but no development of that storyline. There seemed to be a lot of speculation and lack of communication with the 4 Lindas and other people. An ok book but not the best work by this author. 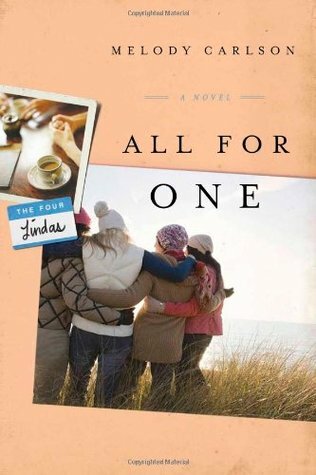 All for One continues the lives of the Four Linda's, their friendship, and how they support each other through life's challenges. I love the characters and the town and the family they've created for themselves. Big smiles as I read. This was a good, easy, entertaining book for me. I needed something to take my mind off my troubles. And this really worked. The characters were interesting as were the things that happened to them. Melody Carlson is not afraid to touch on tough topics, real life issues! And she does this very well!!! Can't wait to read book 4 to see what our 4 ladies will face and how they will resolve all the issues facing them! This series is so realistic and gives a glimpse into the lives of four middle-aged women and issues facing them. I think I liked this one a little more? Maybe? Immediately fell in love with this book. Slow beginning but once you get pass it, it's very good. A must read, the love of friends & God. Heartwarming, true to life, good begats good!! A blessing to enjoy!!! Many years ago, four little girls named Linda met in the same first grade class. They became friends, and went by their middle names in order to avoid confusion. Now, years later, the Lindas are all grown up, and all living in the same town. Their friendship has survived, but they all have different challenges. Abby’s husband has had a bad heart attack, and now Abby is afraid to sleep in case he has another one. Caroline’s mother has Alzheimer’s and she’s weary of caring for her, but doesn’t want to put her in a nursing home. Janie’s boyfriend’s ex-wife is trying to win Victor back, and Janie wonders if she’ll have to find a new relationship with someone else. Marley has some issues with her grown son. This is the third book in Ms. Carlson’s The Four Lindas series, and I recommend reading them in order as they all are closely tied together. I enjoyed reading more about the Lindas in ALL FOR ONE, but some of the events in the book saddened me. Ms. Carlson is a prolific writer, and her characters are very well developed. Any of these women could be someone you know. And they each have their own distinct personality. The fourth (and final) book in this series will release in the fall of 2011. If you are looking for a good women’s fiction, don’t miss ALL FOR ONE. Discussion questions and a sample chapter of the fourth book are included at the end of this book. $14.99. 318 pages. Melody Carlson continues to keep me reading in this third of four book series. She keeps developing each character while bringing in new people with twists and turns. With each book there is a different one of the Linda's I seem to relate more closely to. It is great to see women who gather around each other in all situations. They stay honest with each other through the ups and downs. I am ready for the last one. I hope she finishes as strong as has been through the first three. Ope's Opinions.c Melody Carlson continues to keep me reading in this third of four book series. She keeps developing each character while bringing in new people with twists and turns. I didn't realize this book is the 3rd in a series of 4 books. It is fine as a stand-alone,too. The series revolves around 4 friends, age 53, who met up at again at their 35th class reunion. It really spoke to the problems and emotions we go through as we begin to age. I'm 58 now, and these 4 friends graduated in 1973, the same year as me. I would recommend to all women, single, divorced, widowed, married. There's a friend for each of you. I really enjoyed this continuation of the Four Lindas series. It's fun to get to know the girls on a deeper level, although I continue to be annoyed at the way one of them jumps to conclusions about her marriage. I can identify with Caroline's difficulties in the relationship with her mom, and I look forward to seeing how things are resolved in the next book. This book was just ok. While it dealt with real life issues like divorce and death of a loved one and kid problems, it left me with a this-is-trite feeling. I kept stumbling over the "four friends since h.s. and we still live in the same town" issue too. Seems unrealistic. Lost, heart break, love and reconciltion placed all in Gods box brings forth calm, peace, forgiveness and pray. No matter what age you are in life we still have room for growth and improvement. The importance to keep friends in your corner/circle to lean or be leaned on. another one of the novels down. These books pull you in. I keep trying to guess how their going to end. These were the first books I have read by her and i'm going to have to search some of her other books because she's an amazing writer! This book was the third in the Lindas series and they seem to just keep going. I can't wait to read the fourth book to see how everything comes to an end. The third of the Four Linda series. Fun to follow how the lives of the four Lindas continue to change and grow. TOUCHING. Realistic Christian fiction. I will finish the series. I am enjoying very much following the life of the three Linda's. Cant wait to see how it ends. I like the "Linda" books, but I totally disagree with her take on theology. Friendship and women over time. Abby's character is still beyond annoying, but the other characters are great. Looking forward to reading the final book in the series. Another good addition to this series. I think Janie might be my new favorite, and I hope the crazy ex wife gets her comeuppance in the last book.